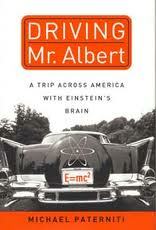 Driving Mr. Albert by Michael Paterniti was a tremendously well written and interesting book that worked on multiple levels. It's subtitled A Trip Across America with Einstein's Brain and is a first-person account of Paterniti travelling cross-country with Thomas Harvey, the man who performed the autopsy on Albert Einstein in 1955 and then kept his brain. The book provides interesting detail on Einstein himself, but also serves as a road trip tale and most profoundly, feels to be an examination of people's lives and how the intersect with others and the meaning derived from that. This most specifically could refer to Harvey in relation to Einstein, but also Paterniti in relation to Harvey and both Paterniti and Harvey and their interactions with others. Really just riveting content that Paterniti weaves together in a melodic fashion with very much the concept of writing about something specific (in this case, a road trip with Einstein's brain), but doing so in pursuit of a much larger idea (a look at the aforementioned relationships). Paterniti definitely put his time into the book with his research taking him (in addition to simply the cross-country drive) to both England and Japan and in terms of how open (including about himself) Paterniti was in Driving Mr. Albert, it reminded me of both The Tender Bar (which I reviewed here) by J.R. Moehringer and Bird by Bird (which I reviewed here) by Anne Lamott.... with the Lamott phrase "warts and all" coming to mind. "Paterniti is a master of finding and telling great stories (the finding, for most writers, often being as difficult as the telling) that appear to be about something small, such as cheese, but are actually about something far larger — in this case, the whole of human existence."